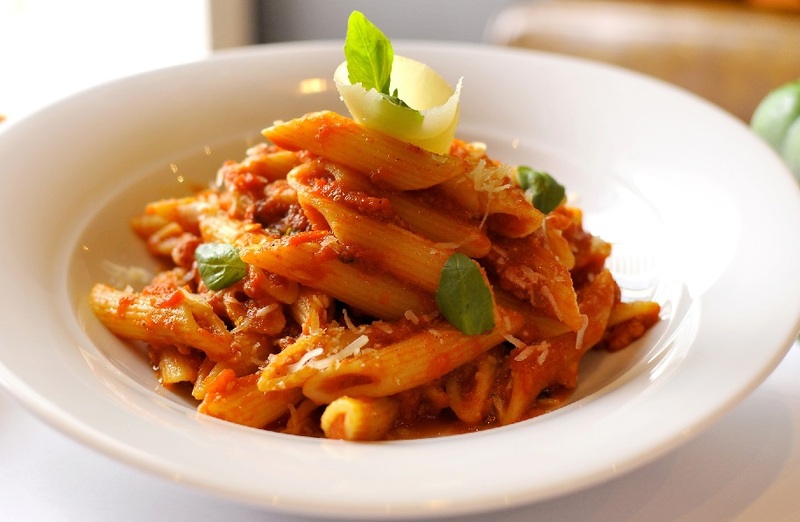 Penne Al’arrabiata: Penne al’arrabiata which literally means penne pasta in angry sauce. Arrabbiatasauce, is a spicy sauce for pasta made from garlic, tomatoes, and red chili peppers cooked in olive oil. “Arrabbiata” literally means “angry” in Italian, and the name of the sauce is due to the heat of the chili peppers. The ridges of penne pasta help hold the sauce, and the tubes can also fill with the sauce creating fiery mouthfuls with each bite. When making arrabbiata with tubular pasta like penne, it’s important to make more sauce than needed to have adequately coated pasta. Drop in your penne pasta. Cook the penne to al-dente (cooked, but still a little firm), time taken to cook the pasta al-dente should be on the packet. Drain the pasta and run it under cold water to stop the cooking process. Add in 1 tbsp olive oil all over the penne, to stop the penne from sticking. Heat 4 tbsp olive oil in a frying pan. Add the chillipepper and garlic to the pan. After about a minute, add the basil leaves. Gently wilt them in the flavored oil. Remove the garlic, basil and chilli from the pan and set aside. Add the chopped tomatoes to the frying pan. Put the garlic, basil and chilli back in the pan with the tomatoes. Simmer for at least 10 minutes, until the sauce has thickened a little. Add the penne to the tomato sauce. Penne Al’arrabiata is ready to be served. Serve Penne Al’arrabiatawith shavings of parmesan and chopped parsley.